An international team of researchers from the University of Copenhagen have successfully developed an innovative 3D method to grow miniature pancreas from progenitor cells. The future goal is to use this model to help in the fight against diabetes. The research results has just been published in the scientific journal Development. The new method allows the cell material from mice to grow vividly in picturesque tree-like structures. Click for image in high resolution. Professor Anne Grapin-Botton and her team at the Danish Stem Cell Centre have developed a three-dimensional culture method which enables the efficient expansion of pancreatic cells. The new method allows the cell material from mice to grow vividly in picturesque tree-like structures. The method offers huge long term potential in producing miniature human pancreas from human stem cells. These human miniature organs would be valuable as models to test new drugs fast and effective – and without the use of animal models. "The new method allows the cell material to take a three-dimensional shape enabling them to multiply more freely. It’s like a plant where you use effective fertilizer, think of the laboratory like a garden and the scientist being the gardener,” says Anne Grapin-Botton. 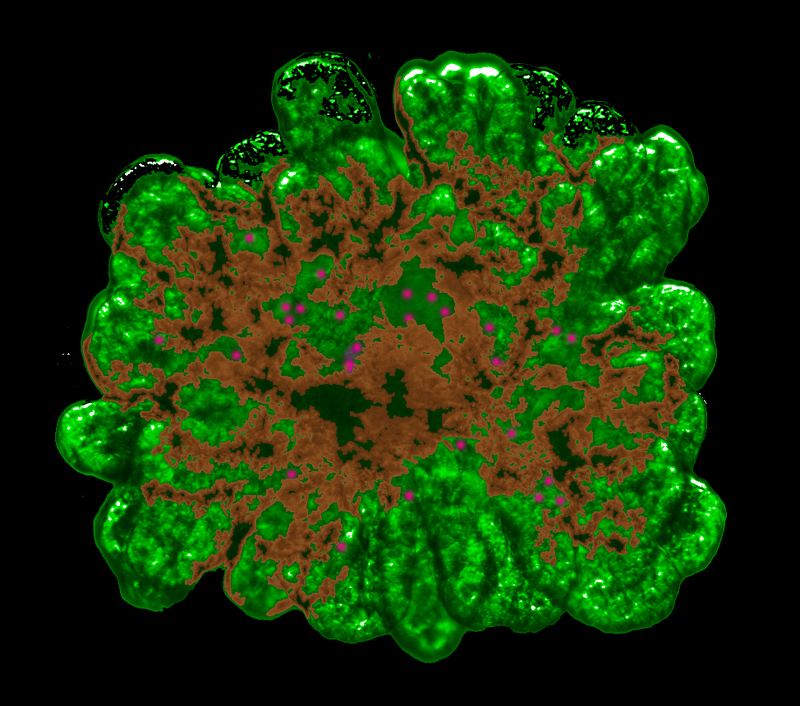 “We found that the cells of the pancreas develop better in a gel in three-dimensions than when they are attached and flattened at the bottom of a culture plate. Under optimal conditions, the initial clusters of a few cells have proliferated into 40,000 cells within a week. After growing a lot, they transform into cells that make either digestive enzymes or hormones like insulin and they self-organize into branched pancreatic organoids that are amazingly similar to the pancreas,” adds Anne Grapin-Botton. The research results has just been published in the scientific journal Development. “We think this is an important step towards the production of cells for diabetes therapy, both to produce mini-organs for drug testing and insulin-producing cells as spare parts. We show that the pancreatic cells care not only about how you feed them but need to be grown in the right physical environment. We are now trying to adapt this method to human stem cells,” adds Anne Grapin-Botton. Even though the pancreas is a little organ, sitting behind the stomach it is a vital organ producing digestive enzymes and hormones called insulin and glucagon. Every 17 seconds a new person is diagnosed with diabetes when their pancreas either doesn't produce any insulin at all or the insulin they do produce is ineffective. Type 1 diabetes occurs when the pancreas is attacked by the immune system. The insulin producing cells, also known as beta cells, are permanently destroyed. The Danish Stem Cell Center (DanStem) opened in the summer of 2011 and is the focal point for international basic, translational and early clinical stem cell research. Professor Anne Grapin-Botton and her team came to DanStem in February 2012. Together with three other internationally recognised research groups – recruited from Switzerland, Scotland and Denmark – they are in full swing establishing and developing the centre. DanStem addresses basic questions about stem cells and developmental biology in order to develop new stem-cell based treatment methods for diabetes and cancer. The Danish Stem Cell Center is supported by two large grants from the Novo Nordisk Foundation (DKK 350 million) and The Strategic Research Council (DKK 64.8 million), respectively. The results are published in the article Artificial three-dimensional niches deconstruct pancreas development in vitro in the scientific journal Development on October 15, 2013 (Vol. 140, Issue 21).